Hello, friends of Clarion! 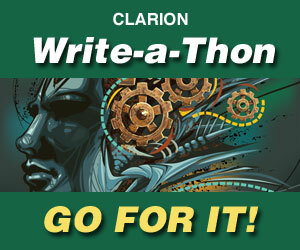 We are now at the halfway point of the Write-a-Thon, and we are halfway to our goal. While it may sound like we’re on track, the overall picture is a bit less rosy, as donations have slowed down considerably. Our writers brought in a total of around $1,000 last week, and if we intend to meet our expenses for next year’s Clarion, we’ll need to more than double that for the next three weeks. It’s not yet time to panic, but it is time to get back on track! Congratulations, by the way, to Curtis Chen, who makes his first appearance on our Top Ten list this week. This is the kind of fresh blood and initiative we need right now! Our current leaders have gone above and beyond to plumb the depths of their creativity and their friends’ and fans’ devotion. It’s time for some new heroes to rise to the occasion! Nearly half of our participating writers have not yet even begun the fight; it’s time to step into the ring and give it your best shot! Every dollar counts. For this week only, our challenge is directed at those of our participating writers who have not yet begun their fundraising efforts. Please take a look at what some of our writers have been doing to bring in donations, and use this as inspiration to come up with a fundraising drive of your own this week. What’s in it for you? Any writer who goes from zero to $100 this week will receive a through, personalized critique and list of suggested markets for a story of your choice from a SFWA member (most likely me, though other volunteers may step up in the happy event that there are too many stories for me to handle). In addition, the writer who makes the biggest leap forward from $0 this week will receive a signed first-edition copy of George R. R. Martin’s A Dance With Dragons. Last week’s writing challenge was successful for a number of our participants. In particular, we’d like to share the creative approach that Damian Breslin took in meeting his daily word count. Along with increasing the volume of material written, this week I decided to try something new to see how it effected my productivity. I started writing on my phone and gathered various apps to keep everything organized. At first it took some training, as I have to teach it to read my atrocious handwriting, but it’s moving along quite nicely. I’ve written an average of 500-600 words per day on my phone, and though it’s a little slower than a computer or laptop, it’s more convenient as I always have it with me. I don’t know that I’ll make this a permanent thing, but my back and neck are thanking me this week. This week it’s time to put on your thinking cap again. Let’s go back to the novel we were looking at in our Week 1 exercise, and apply some story structure to it! This adapted list of turning points comes to you by way of screenwriting teacher Michael Hauge, and it is invaluable for any sort of plot-driven fiction. Those who do not fear spoilers are encouraged to post the details of where these turning points appear in your own novel. Turning Point 1: Your character’s status quo is disturbed as a new, open-ended situation or opportunity arises. This is not the primary plot thread of your novel, just a lead-in, and can happen as early as the first paragraph! Turning Point 3: Around halfway through the story, a Point of No Return occurs that removes the character’s exit strategy completely, and commits them doubly to the plan set out in Turning Point 2. Not only is it more important that they reach The Goal, but often (and it’s best if!) it is much more difficult to do so. Turning Point 4: Toward the end of the novel, the plan falls apart completely and fails. It looks as though the goal will never be achieved. Now the hero must come up with a last-ditch New Plan and desperately push to achieve the goal in a new way before time runs out. Turning Point 5: The final confrontation, in which the goal is either lost or achieved. This ends the story. These turning points are in no way required to make a good novel, but they are extraordinarily useful in pitching/selling one. If used skillfully and invisibly (rather than applied with a sledgehammer), they can give the reader (or publisher) a feeling of security that they are in the hands of a master storyteller. Readers, especially those who have seen films, have internalized this basic structure to a degree that they often feel a bit “lost” in a story if they can’t identify these milestones. It is especially important in a film where you can’t see how many pages are left, but this sort of structure in a novel gives it a feeling of coherence and progress throughout. Give it a try! Can you construct or locate these turning points for your novel? Next: Next post: Writer’s Craft #29 – Never open with a ? I’ve been meaning to ask. Are we writers supposed to constantly put up how far along we are with our writing goals? We feel it is very helpful to others to see how their fellow writers are doing, so we encourage it! But it is entirely voluntary of course. Turning Point 1: Private investigator Cuerva Lachance and acerbic teenager Josiah move in next door to Freddy Duchamp, her sister Mel, and her stepbrother Roland. There is something ever so slightly off about the new neighbours, and Freddy finds her life turned upside down by, especially, the behaviour of Josiah at school. Turning Point 2: Freddy learns that Cuerva Lachance and Josiah believe that either she or one of her siblings is someone the new neighbours have been looking for: someone they need to make a particular choice that apparently has world-changing repercussions. Freddy is suspicious of the story as Cuerva Lachance and Josiah lay it out and makes it her goal to discover and deal with the truth. Her plan, for the moment, consists mostly of snooping and deduction, though as the snooping involves time travel (don’t ask), it’s more exciting than it sounds. Turning Point 3: Freddy discovers that Roland is the person Cuerva Lachance and Josiah are looking for; however, Roland is completely uncooperative and would rather just avoid the situation, a strategy that Freddy cannot convince him won’t work. The problem is made worse by the fact that through her own actions, Freddy has destroyed any trust Roland might once have had in her. In addition, Cuerva Lachance and Josiah have realised that Freddy knows who they’re looking for and have begun to put the pressure on. Turning Point 4: Freddy falls into a trap laid by the neighbours and finds herself completely helpless at the very moment she finally figures out exactly what is going on. Without being able to move or speak at all, she must both convince Roland to trust her and give him some clue that will help him realise the truth too. Turning Point 5: By using her head, Freddy manages to get Roland back on her side, and they work together to solve what Freddy has by now realised has been the problem all along. The combination of his talents and her strategising allows them to win through, albeit not without some compromise and sacrifice. Thoughts: I wasn’t thinking in terms of “turning points” while I was writing the story, but they do seem to be there, so hurrah.